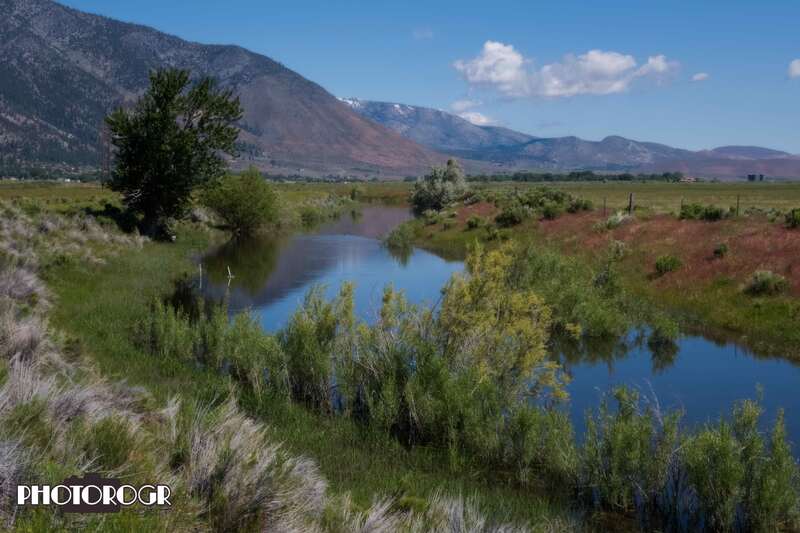 A couple days ago, my lovely bride and I decided to take a hike along the Carson River Trail. I hiked the trail a couple months ago, before the mosquitoes hatched and gained air superiority along the River. Since I didn’t have insect repellent in the PhotoRanger, we cut the hike short to preserve my legs. For the first time ever, someone (meaning the mosquitoes) thought I was sweeter than Susan. Please note – I placed a bottle of Off in the PhotoRanger so I’m not caught unarmed again! While we were on the trail, however, I grabbed a quick shot of the River with the Sierras in the background. The ‘vee’ in the water to the right of the big tree is a Cinnamon Teal swimming away, but trying to maintain a cool demeanor as he did so. Beautiful shot, Roger. But now all I keep thinking about is you running down the trail slapping your face, arms and legs. Thanks Lisa – thankfully, it was just my legs and I didn’t get bit too badly! No lasting effects!